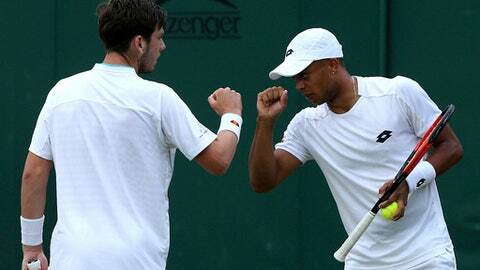 LONDON (AP) After being knocked out in the second round of the men’s doubles on Friday, Cameron Norrie and Jay Clarke had contrasting emotions over how close they had come to a Wimbledon record. The British duo came up short in a three-day, 87-game, 5-hour, 2-minute first-round marathon against Hans Podlipnik-Castillo of Chile and his Argentine partner Marcelo Arevalo. The 6-4, 6-7 (5), 5-7, 6-4, 22-20 scoreline left the match tied for the fifth-most games in men’s doubles at Wimbledon, 15 short of the 102 played when Marcelo Melo and Andre Sa defeated Kevin Ullyett and Paul Hanley 28-26 in the fifth set of their second-round encounter in 2007. Norrie, ranked 75 in singles, doesn’t take doubles ”too seriously”, but was down after being told how close they had come to topping the long-match list. ”It’s tough we just missed the record,” he said. Clarke, who spoke later after returning to the court to win a first-round mixed doubles match alongside fellow British player Harriet Dart, held a different view. Having started on Wednesday evening, the encounter resumed late on Thursday and was suspended once more with Norrie and Clarke leading 4-3 in the fourth set. The British pair saved eight match points, before the fifth set finally came to an end after 2 hours and 24 minutes. ”I thought it was pretty poor scheduling,” said Norrie, who felt the match should have resumed earlier on Thursday. Melo was also in men’s doubles action on Friday, as he and Lukasz Kubot made a second-round exit. The Brazilian was happy to have held on to his record. Those doubles tussles pale in comparison to Wimbledon’s longest-ever match. It took John Isner 183 games to defeat Nicolas Mahut in a 2010 first-round men’s singles clash. The American player prevailed 70-68 in the fifth set after 11 hours and five minutes. Norrie said he was thinking about Isner and Mahut as his match went on, and also the possibility of a plaque like the one on Court 18 that commemorates their encounter.